The Forced Evolutionary Virus, or FEV as it's more commonly known, is one major cause of mutations in the post-war Fallout world. Radiation alone is not enough to induce the sorts of changes commonly seen in super mutants and other creatures; generally speaking, the only lasting effects of exposure to gamma and other forms of radioactivity are hair loss, internal bleeding, cancers and ultimately, death. The Fallout FEV virus allows organisms to undergo radical changes in their genetic structure that increase their survivability in the post-nuclear America. It also, as we shall see, produces monstrous and hideous alterations to their physical and biological structures. 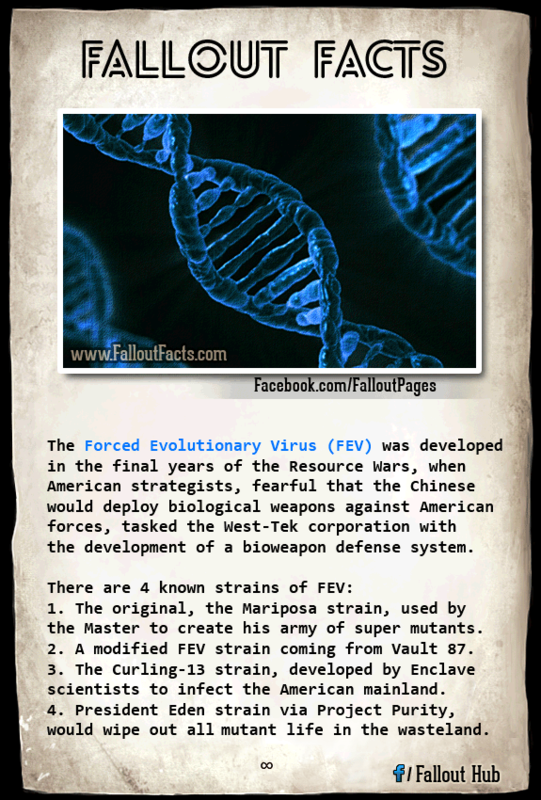 The FEV was developed in the final years of the Resource Wars, when American strategists, fearful that the Chinese would deploy biological weapons against American forces, tasked the West-Tek corporation with the development of a bioweapon defense system. The first attempts produced the “Pan-Immunity Virion Project”, or PVP, which stimulated the human immune system in such a way that any Chinese biological agents would be rendered ineffective. In essence, the PVP altered the subject's DNA such that the double-helical molecular structure was transformed into a quadruple helix. During testing in 2075, abnormal side effects were noted in test subjects, such as dramatic growth of size and muscle mass, with corresponding increase in brain activity. Seeing the military potential of the PVP, the U.S. Army took over West-Tek's operations and renamed the project FEV. Military testing on prisoners began at Mariposa Military Base in California. The military garrison guarding the facility, however, grew increasingly uneasy about the horrific experiments being done in the name of national security. One commander took his own life as a result; his successor took over and began interrogating the Mariposa scientists, eventually shutting the project down in October 2077. Days later, however, the Great War was “fought” between China and America, and the project was forgotten entirely. The military commander, Captain Roger Maxson, led his troops from Mariposa to the Lost Hills emergency bunker, where they eventually formed the Brotherhood of Steel. Detailed records of the FEV's composition and development were kept by ZAX 1.2, a giant supercomputer developed by Vault-Tec and later assigned by the U.S. Army to biological weapons and tactical research. According to ZAX, the FEV is a “shifting-absorptive megavirus with a protein sheath reinforced by ionized hydrogen that makes it immune to radiation”. It works like many other viruses, by copying the host's DNA and rewriting it using pre-programmed genetic information. The FEV is unique in that its genetic code is recursive, allowing it to infinitely repeat and reinsert its genome into the host. Among the effects of FEV exposure are greatly increased muscle and tissue growth, increased neural activity, and increased intelligence. Creatures known to have been created through FEV exposure are the super mutants, the nightkin, deathclaws and possibly some ghouls. A common side effect is sterility. It is theorized that this is due to the FEV misinterpreting single-strand DNA-containing cells (haploid gametes) as genetic damage and attempting to “correct” it. These effects are neither consistent nor predictable, however, and more often than not exposure produces monsters barely capable of survival. Floaters, centaurs, and other abominations are common monstrosities seen throughout the wasteland. The original, the Mariposa strain, was developed at Mariposa Military Base and eventually was used by the Master to create an army of super mutants. Other creatures were created as well, including centaurs and Harold. Some remnants of this original army moved east to settle in the Mojave. A modified FEV strain was identified at Vault 87 in the Capital Wasteland. 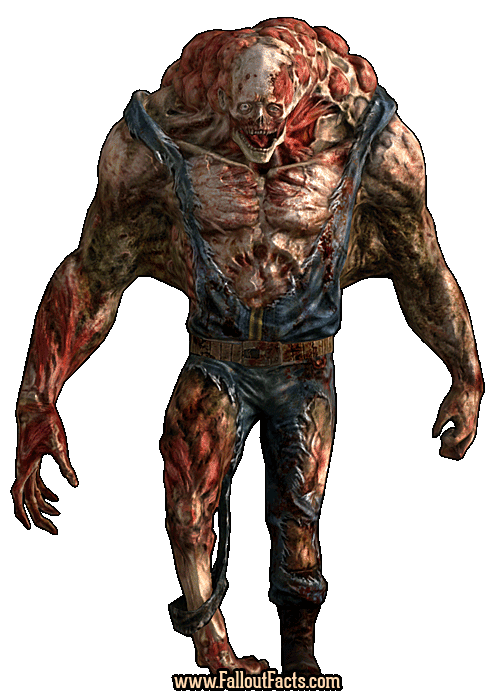 This, too, was responsible for creating a super mutant army, though without any actual leader. This strain produces genderless, sterile mutants whose size increases and intelligence declines with age. The Vault 87 strain also produces centaurs and other abominations. The Curling-13 strain was developed by Enclave scientists as an airborne bioweapon designed to infect the American mainland. Apparently the intent was to remove all traces of “mutant” inhabitants. President Eden of the Enclave developed a fourth strain and planned to deploy it via Project Purity in order to cleanse the Wasteland of mutation. If used, it would effectively wipe out all human life (“impure” humans - which are not from the Vaults) and all mutants in the Capital region. Want even more information on FEV? Sorry, but you do not register as an individual of sufficient clearance to requisition that information. And that's all we've got on Fallout FEV Virus. Enough for today, stay tuned for more Fallout Facts. Did you find this article interesting? Share it!